The Sri Lankan team management's efforts to improve the batting of their tailenders have paid rich dividends during the Test series against India, with No. 10 Ajantha Mendis making a potentially match-winning 78 on the fourth day at the P Sara Oval. His effort followed half-centuries by Rangana Herath and Lasith Malinga in the first Test in Galle. 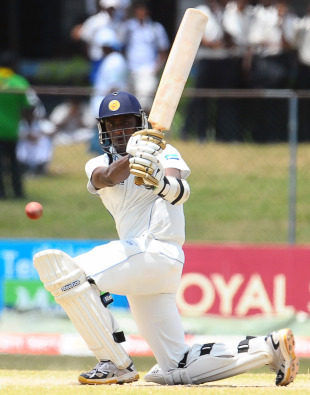 Mendis made his maiden first-class half-century and, with Thilan Samaraweera, added 118 runs for the ninth wicket to help lift Sri Lanka from 125 for 8 to 267, setting India a target of 257 to draw the three-Test series. "When I went into bat I faced a difficult situation and I was determined to support Thilan (Samaraweera) in his endeavour to get some runs on the board," Mendis said. "I concentrated quite a lot and at the same time the wicket didn't do much and that also helped. I was able to build a good partnership with Thilan and bring the side to a good position. "My initial thoughts were to get the team up to a total of around 150 but as my confidence grew I thought of scoring as many runs as possible. My intention was to accumulate runs and even a single was valuable at that time because it was going to cause problems for the side batting last." Mendis said he had not concentrated much on his batting because he was doing a lot of work with his bowling when he joined the Sri Lankan team. "But I realised I had to improve my batting also and during practice I concentrated a lot in that area. Manoj Chanaka (a member of the support staff) helped me in my batting with the bowling machine and I also got practice from the Under-19 bowlers, which has led to the improvement in my batting." Mendis was confident Sri Lanka would wrap up the Test by mid-afternoon on the final day if they managed a few wickets in the morning session. "There is a tendency for wickets to fall in the morning session and we should be able to make use of that opportunity."